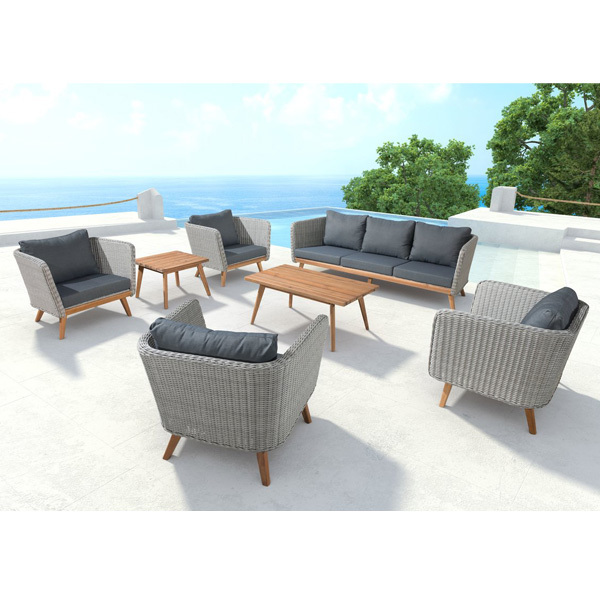 Elegant, simple and exceptionally comfortable outdoor seating! 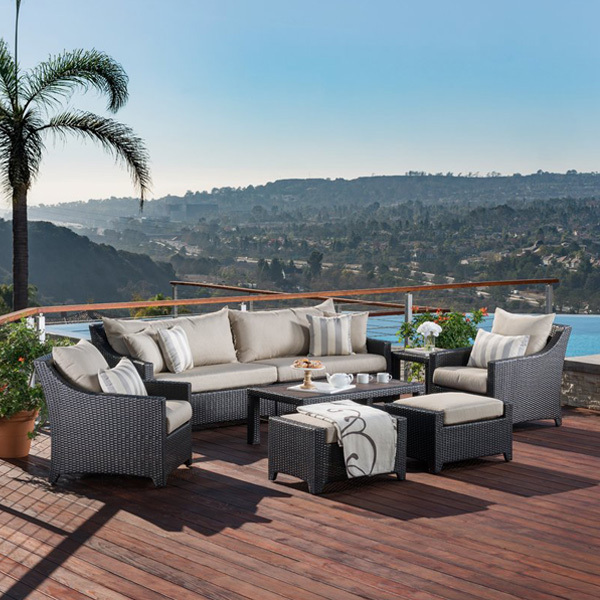 This hand woven, rich, espresso colored polyethylene wicker set provides a stunning contrast to any landscaping back-drop. Hand-woven, commercial grade resin wicker is specifically engineered for rugged outdoor use. 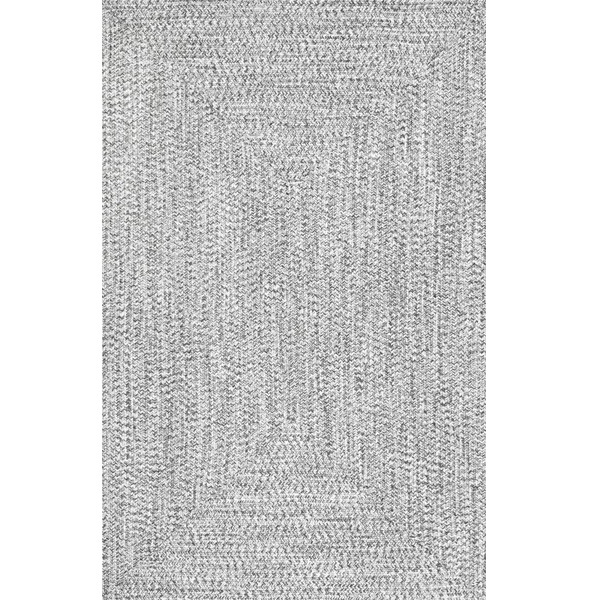 UV and fade resistant, this weave is developed to withstand harsh environments in all climates. 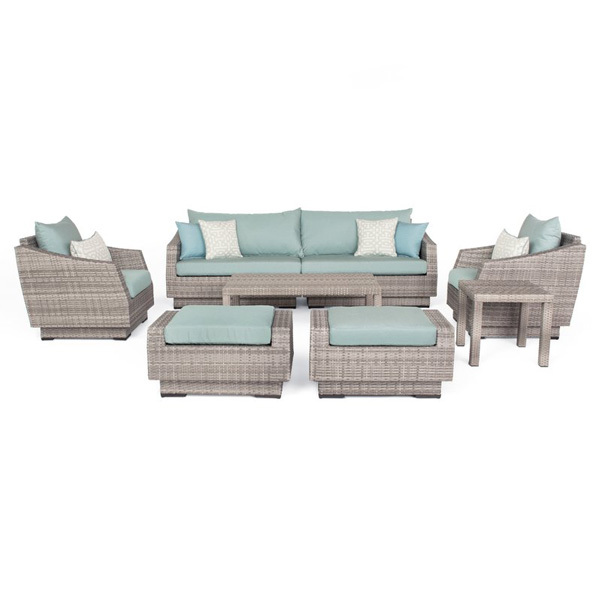 Patented outdoor cushion system that provides high-quality comfort and low maintenance. Multi-layered, deep 6″ weatherproof foam cushions deliver unrivaled relaxation. 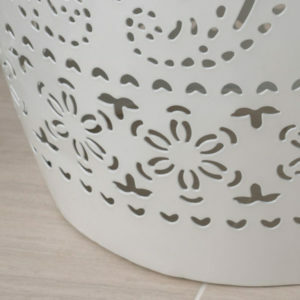 PVC mesh bottom allows the moisture to completely drain out of the base cushions. Quick change cover system allows you to easily move or remove your cushion covers to clean or refresh your style. Cushions are wrapped in Sunbrella® performance fabric. UV and fade resistant, this long-lasting fabric is suited for all environments while maintaining a plush and supple feel. Easily clean tough stains with mild soap and water for an enduring pristine surface. Frames are lightweight but hard-wearing. Impervious to harsh weather, UV rays, and fading, they hold up beautifully even in salt and chlorinated environments. 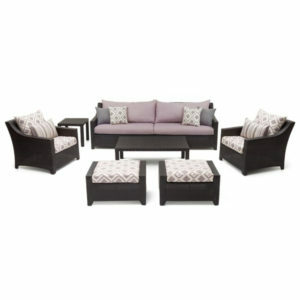 Set includes: 2 sofa halves, 2 club chairs, 2 club ottomans, 1 coffee table & 1 side table + cushions & throw pillows! A shady oasis is only an umbrella away! 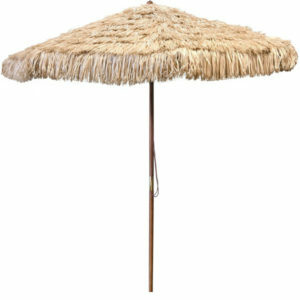 Standing nine feet tall, the Hula Umbrella features a dark brown wood frame with a water-resistant 140 grade polyester canopy, covered by grass. Canopy is 9′ in diameter. Pulley style lift. Pole is 1.5″ in diameter. Need a sturdy base? We have those too! This umbrella has a 9-foot diameter canopy which can provide around 63 square feet of shade. 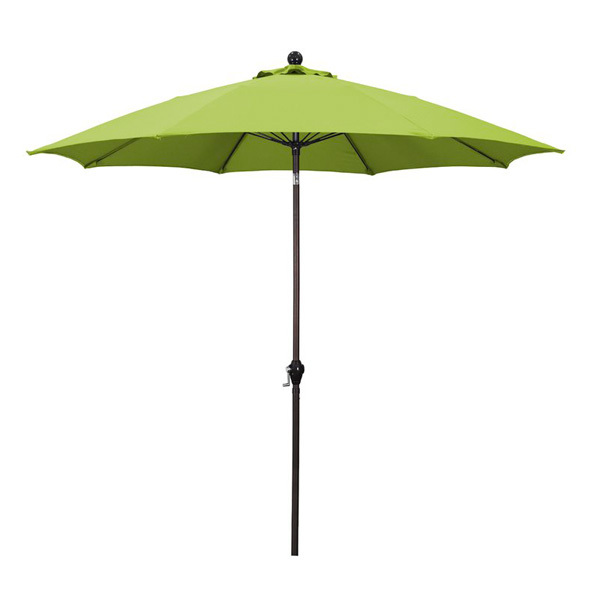 Featuring a weather-resistant canopy, this essential umbrella offers some shade to your patio dining set or poolside seating group. 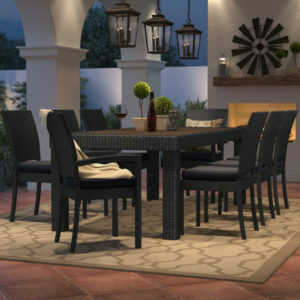 It’s perfect for shading an entire six person dining set so you can ensure the comfort of all your guests during outdoor meals and relaxing conversations. With the push-button tilt function, tilt your umbrella to keep up with the sun’s movement and extend your shady outdoor time. Water & rust resistant! 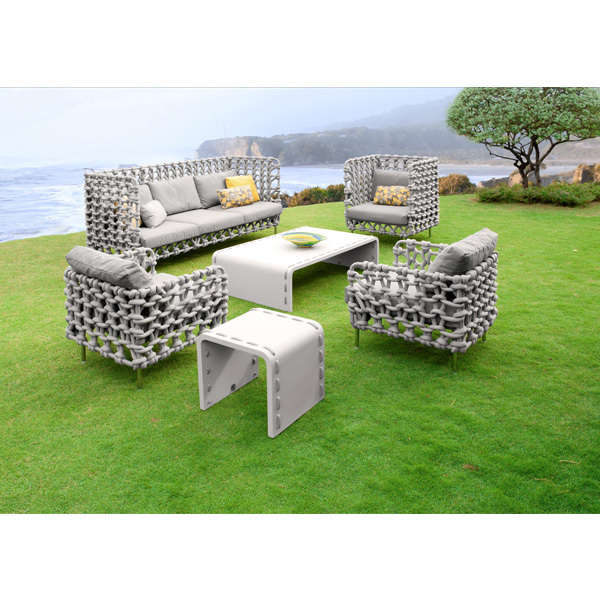 This timelessly modern outdoor seating group features Sunbrella fabric (removable), UV & rust resistant aluminum frame, outdoor wicker and includes: 2 Sofa Halves, 2 Club Chairs, 2 Ottomans, 1 Coffee Table & 1 Side Table. Available in multiple colors. Wash with hose/Mild Cleaner. Seats, sofas and ottomans come fully assembled. Tables require minor assembly (10-15 minutes). Set a solid foundation for a shady outdoor oasis with this freestanding umbrella base. Crafted from solid sheet metal filled with concrete in a powder-coated finish, this weather-resistant design strikes a streamlined circular silhouette. 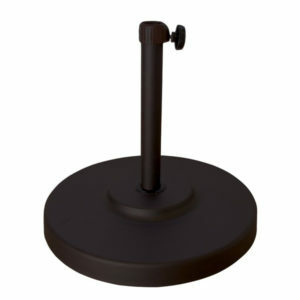 Designed to fit umbrella poles up to 2” in diameter, the straight base tube holds up to 14” of pole, and includes a tightening knob for a sturdy fit. Available in 4 colors. 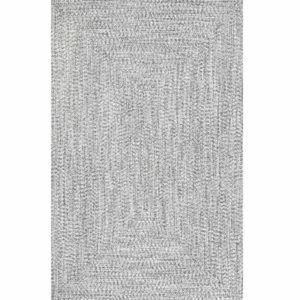 Breez has an organic, sinuous & familiar free-form characteristics making it ergonomically inviting. As applied to the Breez collection, the outcome is a stunning series made of a steel frame treated with nano-ceramic cataphoresis and powder coating processes. Frame colors are white or dove – optional white cushion or full Sunbrella white coverlet are removable, easy to wash & weather resistant. Cabaret offers a truly unique design for indoor & outdoor seating options! This wicker accent table is ideal for keeping snacks and drinks near your seating and is a great addition to a contemporary setting! 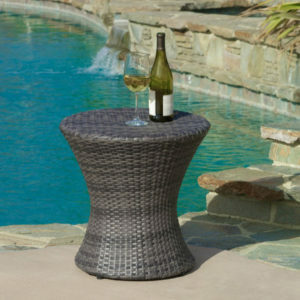 The Side table is made using wicker and aluminum, which makes it strong and durable. 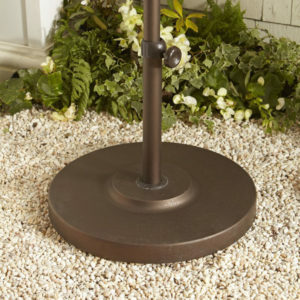 It is a great accent piece for patio, poolside, or backyard. This table serves well as a decorative and functional outdoor furniture. 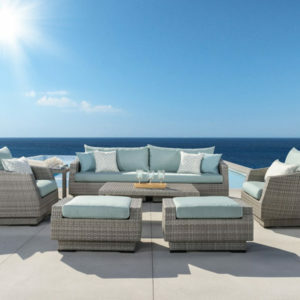 It can be paired with lounge chairs for enhancing the overall appeal of an outdoor decor. 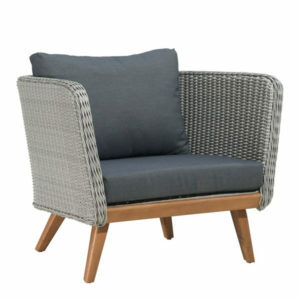 Available in gray, brown or black PE Wicker to match any outdoor decor! 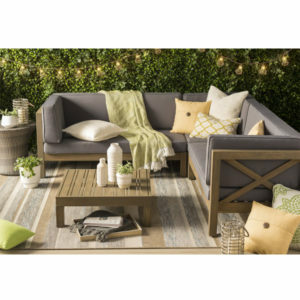 Update your deck or patio with this classic Mid-Century re-invention, featuring plush charcoal gray seat / back plush cushions is sun-proof acrylic dyed solution with open weave to foam and fill cushions; avoiding moisture buildup. 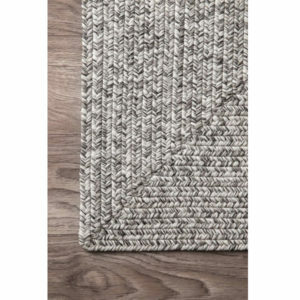 The light gray synthetic wicker weave is elegant and sturdy; while the warm walnut colored Acacia wood base has a natural finish and is accented by matching angled style legs. Seats 7 persons! The full set includes: 1 Sofa, 4 Arm Chairs, 1 Coffee Table & 1 Side Table. Individual options available. Enjoy meals or games with family and guests. This set seats up to eight adults with plush seating and 4 color options. 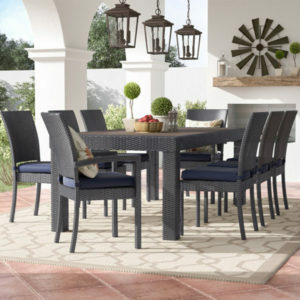 Includes an 83″ long table, two arm chairs and six side chairs plus cushions with removable covers in Sunbrella fabric for each. 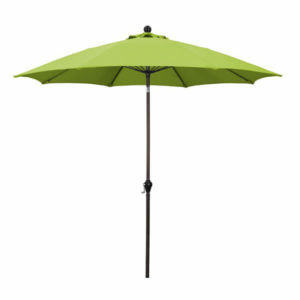 For shade or protection from the elements, the dining table features a hole for umbrellas with posts up to 2 inches in diameter. It includes a rubber cap to cover the opening when not in use. High density, quick drying foam cushions ensure comfort and convenience. 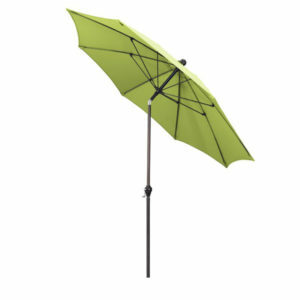 Designed for use in both hot and cold climates and is water, UV & rust resistant. Virtually maintenance free – simply rinse clean with a hose and mild cleanser. Environmentally friendly and 100% recyclable. 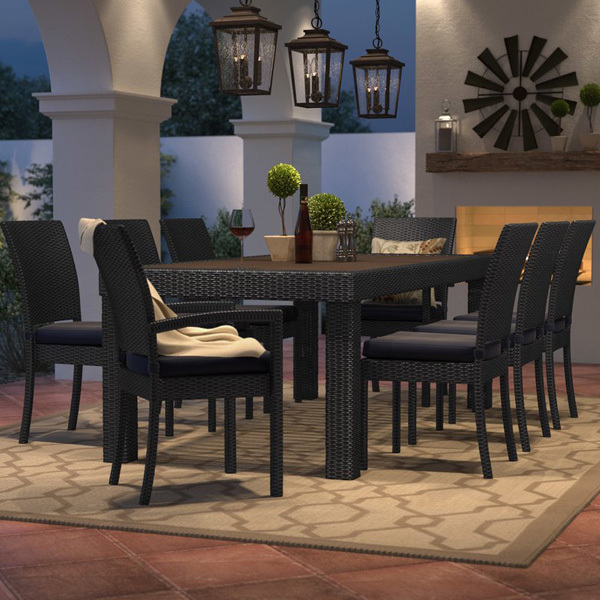 Wicker/rattan is a dark gray finish while table top slats are an espresso colored polyresin. 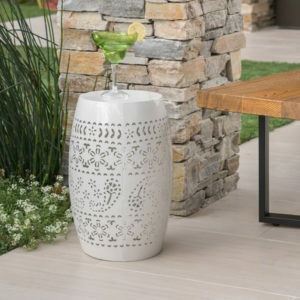 The perfect sidekick for any reading chair, poolside lounger, or cozy corner, this iron side table lends a touch of global-inspired style to your favorite spaces—outdoors and in. Pierced floral details bring a pop of personality to this table’s exterior! Wipe with cloth and mild soap.